Synthetic peptide conjugated to KLH derived from within residues 200 - 300 of Human PRMT6. 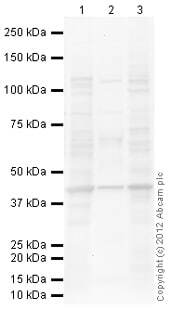 This antibody gave a positive signal in Human Testis as well as A498 and HeLa whole cell lysates. Our Abpromise guarantee covers the use of ab104834 in the following tested applications. Arginine methyltransferase that can catalyze the formation of both omega-N monomethylarginine (MMA) and asymmetrical dimethylarginine (aDMA), with a strong preference for the formation of aDMA. Preferentially methylates arginyl residues present in a glycine and arginine-rich domain and displays preference for monomethylated substrates. Specifically mediates the asymmetric dimethylation of histone H3 'Arg-2' to form H3R2me2a. H3R2me2a represents a specific tag for epigenetic transcriptional repression and is mutually exclusive with methylation on histone H3 'Lys-4' (H3K4me2 and H3K4me3). Acts as a transcriptional repressor of various genes such as HOXA2, THBS1 and TP53. Repression of TP53 blocks cellular senescence (By similarity). Also methylates histone H2A and H4 'Arg-3' (H2AR3me and H4R3me, respectively). Acts as a regulator of DNA base excision during DNA repair by mediating the methylation of DNA polymerase beta (POLB), leading to the stimulation of its polymerase activity by enhancing DNA binding and processivity. Methylates HMGA1. Regulates alternative splicing events. Acts as a transcriptional coactivator of a number of steroid hormone receptors including ESR1, ESR2, PGR and NR3C1. Promotes fasting-induced transcriptional activation of the gluconeogenic program through methylation of the CRTC2 transcription coactivator. May play a role in innate immunity against HIV-1 in case of infection by methylating and impairing the function of various HIV-1 proteins such as Tat, Rev and Nucleocapsid protein p7 (NC). Highly expressed in kidney and testis. Belongs to the class I-like SAM-binding methyltransferase superfamily. Protein arginine N-methyltransferase family. PRMT6 subfamily. Contains 1 SAM-dependent MTase PRMT-type domain. ab104834 (1/200) staining PRMT6 in HeLa cells (green). Cells were fixed in paraformaldehyde, permeabilised in 0.5% Triton X-100/ PBS and counterstained with DAPI in order to highlight the nucleus (red). For further experimental details please refer to Abreview. Additional bands at: 120 kDa, 68 kDa, 80 kDa. We are unsure as to the identity of these extra bands.